The behavioral and electroantennographic responses of Prorhinotermes canalifrons to its soldier frontal gland secretion, and two separated major components of the secretion, (E)-1-nitropentadec-1-ene and (E,E)-α-farnesene, were studied in laboratory experiments. Behavioral experiments showed that both the frontal gland secretion and (E,E)-α-farnesene triggered alarm reactions in P. canalifrons, whereas (E)-1-nitropentadec-1-ene did not affect the behavior of termite groups. The alarm reactions were characterized by rapid walking of activated termites and efforts to alert and activate other members of the group. 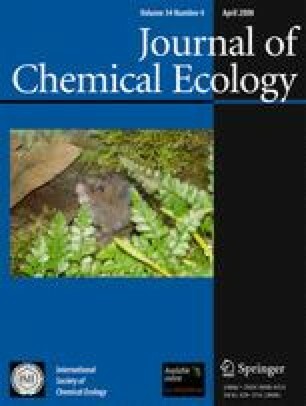 Behavioral responses to alarm pheromone differed between homogeneous and mixed groups, suggesting complex interactions. Antennae of both soldiers and pseudergates were sensitive to the frontal gland secretion and to (E,E)-α-farnesene, but soldiers showed stronger responses. The dose responses to (E,E)-α-farnesene were identical for both soldiers and pseudergates, suggesting that both castes use similar receptors to perceive (E,E)-α-farnesene. Our data confirm (E,E)-α-farnesene as an alarm pheromone of P. canalifrons. We are grateful to Jakub Janda (Prague, Czech Republic) for the development of the MouseTracer software. We acknowledge Anna-Karin Borg-Karlson (Stockholm, Sweden) for the gift of (E,E)-α-farnesene. We also thank Jean-Pierre Bourguignon (Halle, Belgium) for the production of the test chambers. This research was supported by FRFC (postdoctoral stay of J.Š., project no. 2.4597.05) and by the Grant Agency of the Academy of Sciences of the Czech Republic (project no. A600550614). T. Bourguignon was supported by a predoctoral fellowship from the FRIA, Belgium. We thank two anonymous reviewers for constructive suggestions.